Something I’m wondering now that Daylla has twice threatened to deal physical violence to Dustin for thinking she’s dead/a ghost: In this time/place/world, in her current form, can she even hit him? Or would her ghostly fist just pass right through him? Okay, NOW he’s yanking her chain. Is it friendly teasing, or is he trying to get her to do something stupid or dangerous? He is exercising a well-recognized capability of the male of the species. He’s a little young to be that hard of listening. I’m wondering if he’s related to a Monica. In spirit, if not necessarily in blood. They do seem to have some things in common. After all, the situation has already ripped out his heart… and he got better very quickly. If it turns it that he can fart rainbows, that’ll settle it! Belt him a good one, Daylla. Well, Daylla just may have well already figured this all out. He’s surprisingly ok with interacting with his supposedly dead girlfriend. I suppose if you can see and talk to a loved one in real time, it’s very hard to maintain the concept that she’s dead and gone. I would imagine when she tries to belt him and her hand goes right through him, it would all come rushing back like such a horror should. This whole story arc is going to require a good re-read once it’s done! 1. 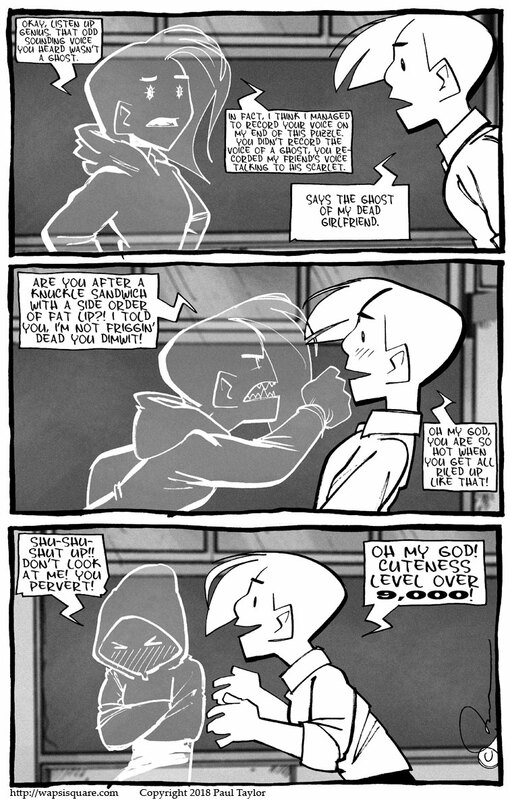 Is a ghost (or “ghost” in this case) able to punch you? 2. Can you make out with a ghost? And if she can’t punch him, and tries, how much will that frustrate her? I wouldn’t call them lovers. And I’d like to know what happened to Dustin’s Dayla. For all we know, she may be caught between universes. Think I’ve sussed it. NEITHER are ghosts. This is the first instance of cross-dimensional communication. Cos it’s cross reality, they just LOOK like ghosts to each other. So next week we’ll be back to “real” Dayla’s perspective of talking to an unknown “ghost” who claims to be her boyfriend? At least Daylla is showing her smarts in having figured this out. Wait ’til Daylla meets the Dustin on HER side of the world. It could be 1) awkward 2) embarrassing and 3) physically painful when Daylla decks him. Considering that in our Daylla’s world, this particular room hasn’t been used for 20 years, presumably because it feels haunted, I’m thinking that if there IS a Dustin on our side, he may be about 20 years older than the one we’re seeing here. Wonder what year the Dustin on this page thinks it is?